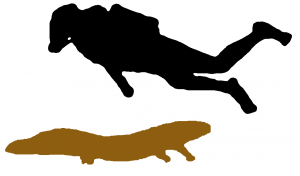 Chinese Giant Salamander is the biggest Amphibian and the biggest Salamander in the world! 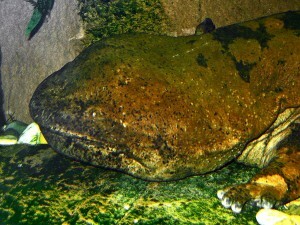 The average adult Chinese Giant Salamander is about 25 to 30 kilograms (55 to 65 pounds) and 1.15 metres (45 inches), but it can reach a length of 180cm (6 feet) and weigh up to 65 kilograms (144 pounds). It lives in rocky mountain streams and lakes in China. Its population is critically threatened and it has been classified as endangered because of habitat loss, pollution and over-harvesting. It is considered a delicacy and it is used in traditional Chinese medicine. It is heavily built. It has a large compressed head, small eyes and wrinkly rough porous dark skin. It has small nostrils. It has teeth. Its legs are short and flat. There are 4 toes on the forelimbs and 5 toes on the hind limbs. It feeds on insects, frogs and fish. It hunts mainly at night. It has very poor eyesight and no eyelids. Therefore, it depends heavily on its special sensory nodes which are located along its sides from the head to the tail. It is able to sense the slightest vibrations around it with the help of these nodes. Therefore, they are able to detect their prey and quickly escape from predators. The female will lay about 500 eggs in a string in an underwater cavity. The male will guard these precious eggs until they are hatched. It will take between 50 to 60 days for the eggs to hatch. The larvae start to eat after 30 days. The gills on the larvae will become smaller when they are about 20-25cm (8-10 inches) long. The larvae have a similar shape to the adult salamanders. The adult has gill slits and lungs to breathe. Chinese Giant Salamanders have lived as long as 75 years in captivity.